Download "BUSINESS ENGLISH PHONE MESSAGES 05 UNDERSTANDING PHONE GREETING 01"
1 LEVEL BUSINESS ENGLISH PHONE MESSAGES 05 UNDERSTANDING PHONE GREETING 01 IN CONTEXT 5-8 min a. 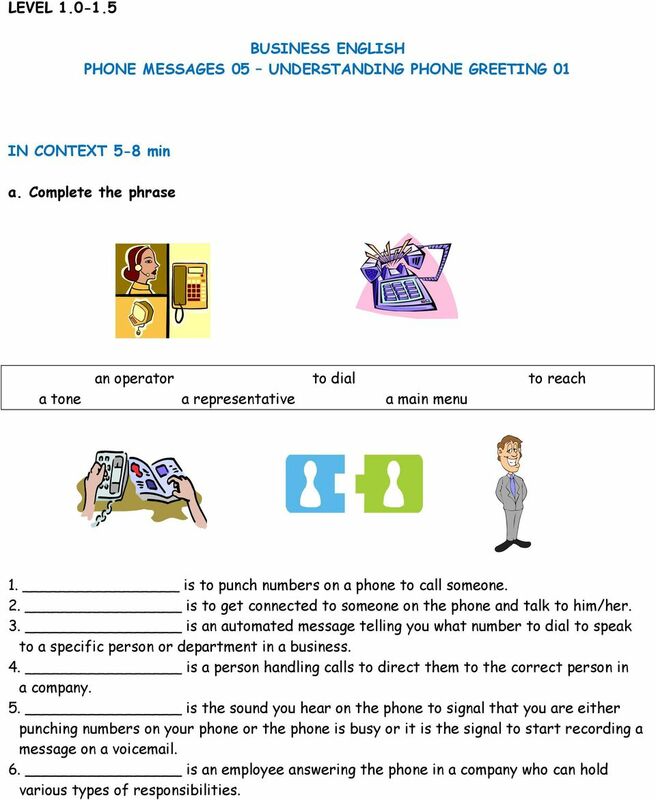 Complete the phrase an operator to dial to reach a tone a representative a main menu 1. is to punch numbers on a phone to call someone. 2. is to get connected to someone on the phone and talk to him/her. 3. is an automated message telling you what number to dial to speak to a specific person or department in a business. 4. is a person handling calls to direct them to the correct person in a company. 5. is the sound you hear on the phone to signal that you are either punching numbers on your phone or the phone is busy or it is the signal to start recording a message on a voic . 6. is an employee answering the phone in a company who can hold various types of responsibilities. 2 b. 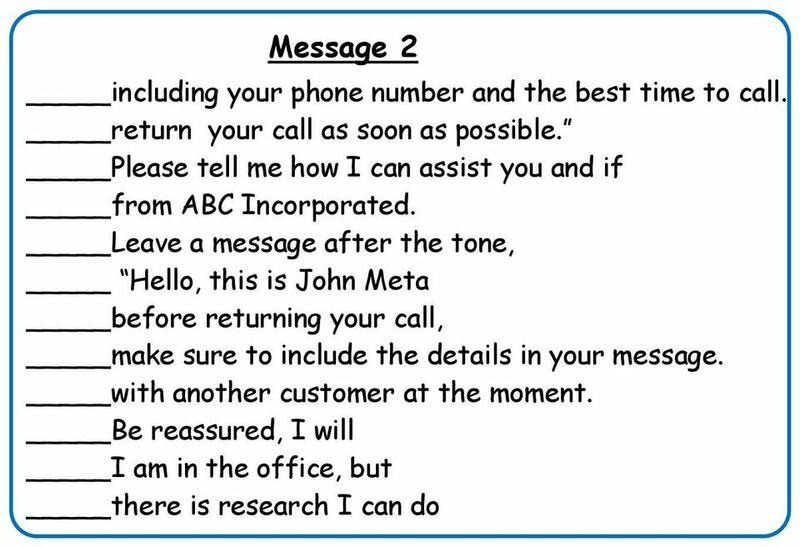 Read and complete with the words from the previous activity an operator - to dial - to reach - a tone - a representative - a main menu 1. message Thank you for calling Company Name. Please select from the following options. For the Sales Department please 2. one. 3. the Accounting Department dial two. To speak with 4. dial zero. Please make your selection now. 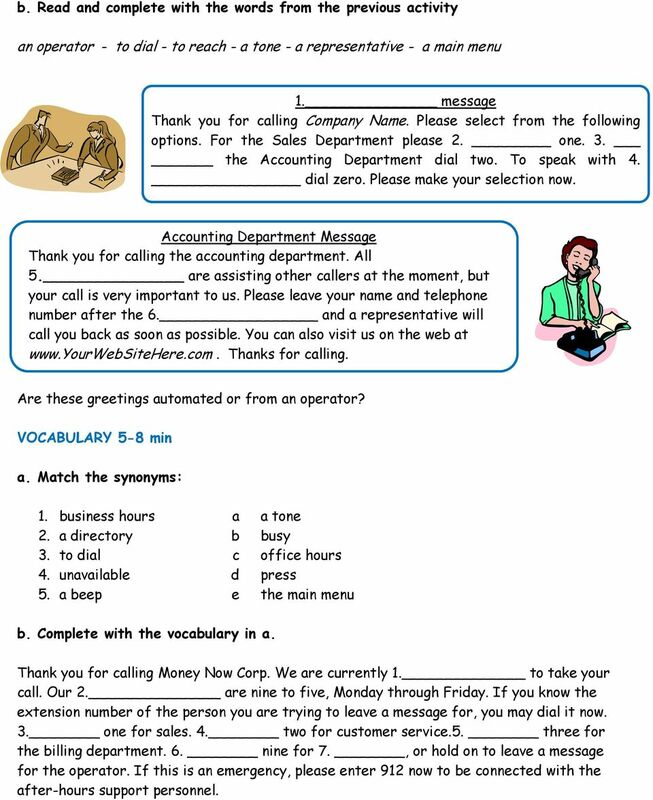 Accounting Department Message Thank you for calling the accounting department. All 5. are assisting other callers at the moment, but your call is very important to us. Please leave your name and telephone number after the 6. and a representative will call you back as soon as possible. You can also visit us on the web at Thanks for calling. Are these greetings automated or from an operator? VOCABULARY 5-8 min a. Match the synonyms: 1. business hours 2. a directory 3. to dial 4. unavailable 5. a beep a b c d e a tone busy office hours press the main menu b. Complete with the vocabulary in a. Thank you for calling Money Now Corp. We are currently 1. to take your call. Our 2. are nine to five, Monday through Friday. If you know the extension number of the person you are trying to leave a message for, you may dial it now. 3. one for sales. 4. two for customer service.5. three for the billing department. 6. nine for 7., or hold on to leave a message for the operator. If this is an emergency, please enter 912 now to be connected with the after-hours support personnel. 4 b. Watch, listen and complete The message you ll hear is in British English This is the 1. for Richard Webster or Richard Webster Photography. I m 2. Richard 3. your call right now. So, please 4. your 5. on a message and he will 6. to you as 7. as he can. Thank you for 8.. 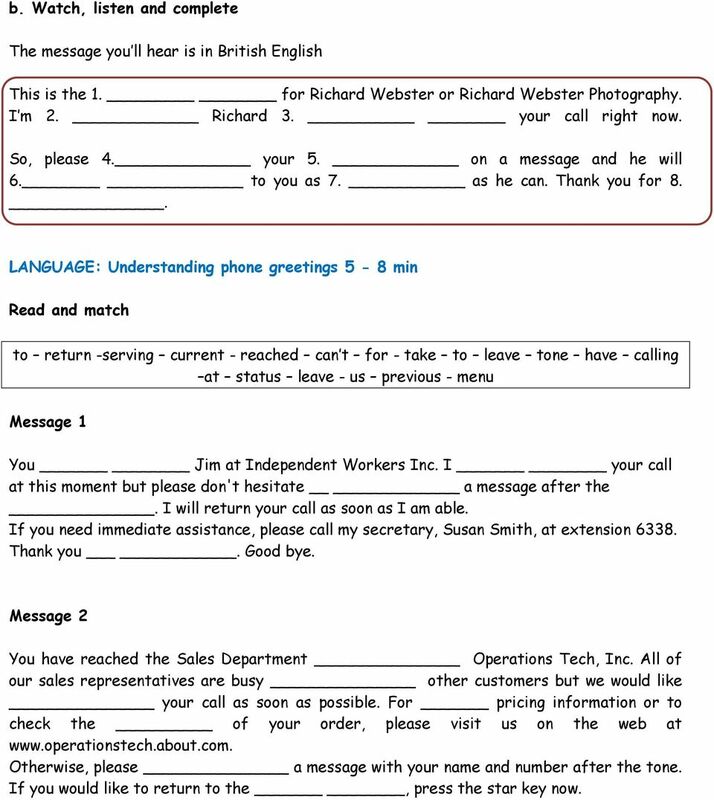 LANGUAGE: Understanding phone greetings 5-8 min Read and match to return -serving current - reached can t for - take to leave tone have calling at status leave - us previous - menu Message 1 You Jim at Independent Workers Inc. I your call at this moment but please don't hesitate a message after the. I will return your call as soon as I am able. If you need immediate assistance, please call my secretary, Susan Smith, at extension Thank you. Good bye. Message 2 You have reached the Sales Department Operations Tech, Inc. All of our sales representatives are busy other customers but we would like your call as soon as possible. For pricing information or to check the of your order, please visit us on the web at Otherwise, please a message with your name and number after the tone. If you would like to return to the, press the star key now. 5 WRITING 5-8 min With the help of your instructor, prepare a message you would record for your phone extension at the office. Message 1: Not available/busy message You work for a micro-business. 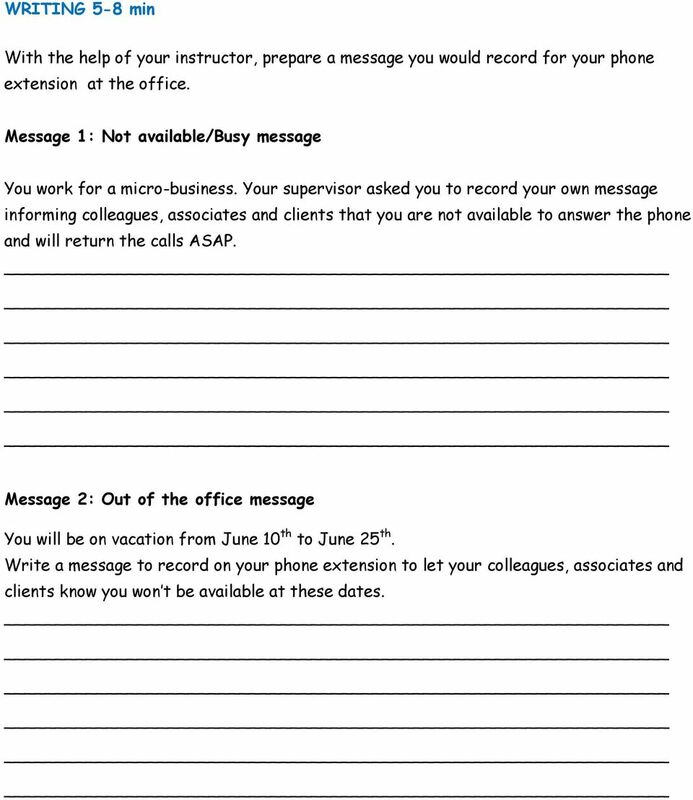 Your supervisor asked you to record your own message informing colleagues, associates and clients that you are not available to answer the phone and will return the calls ASAP. Message 2: Out of the office message You will be on vacation from June 10 th to June 25 th. Write a message to record on your phone extension to let your colleagues, associates and clients know you won t be available at these dates. 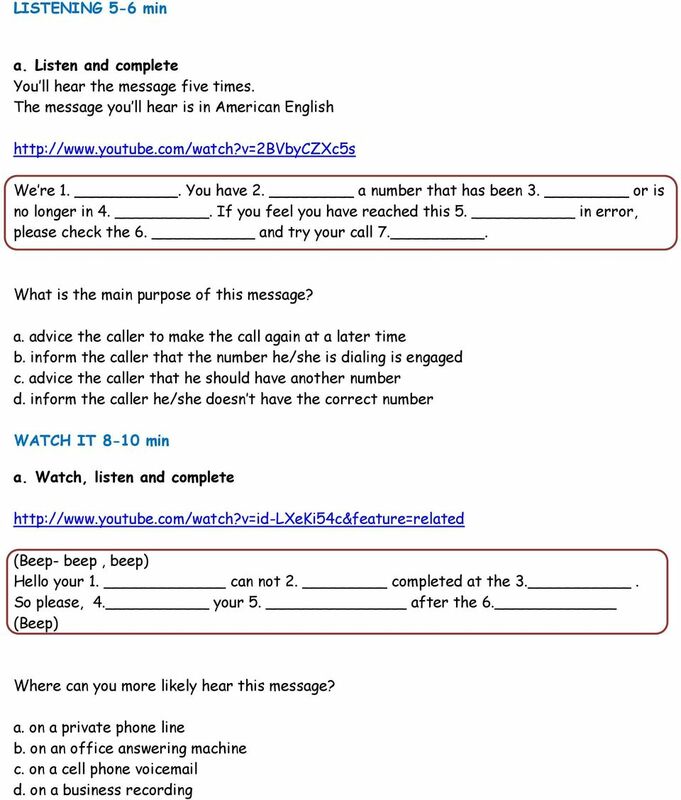 6 SPEAKING 5-8 min Recording Use the message you wrote from the previous exercise, practice pronunciation and pauses as if you would record yourself. Optional: Then record the message and play it. How does it sound? 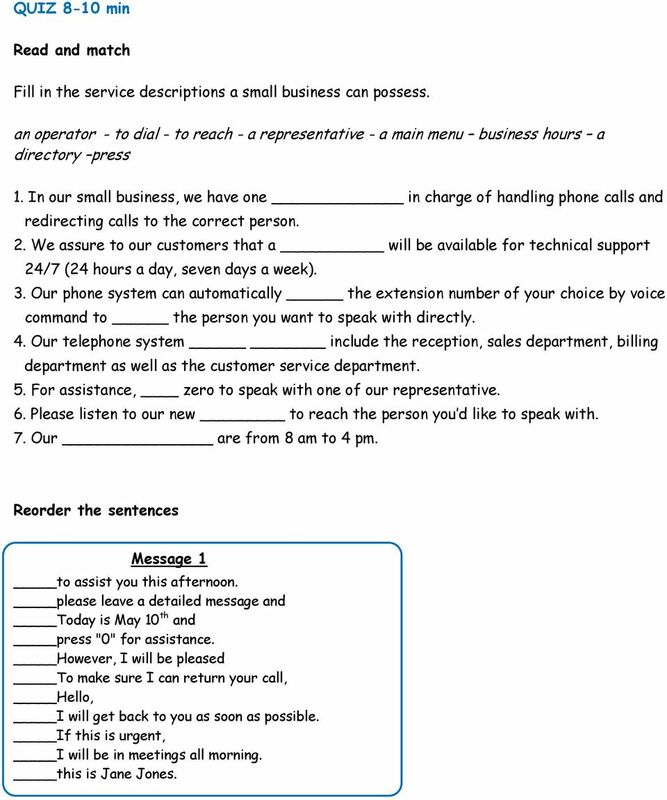 7 QUIZ 8-10 min Read and match Fill in the service descriptions a small business can possess. an operator - to dial - to reach - a representative - a main menu business hours a directory press 1. In our small business, we have one in charge of handling phone calls and redirecting calls to the correct person. 2. We assure to our customers that a will be available for technical support 24/7 (24 hours a day, seven days a week). 3. Our phone system can automatically the extension number of your choice by voice command to the person you want to speak with directly. 4. Our telephone system include the reception, sales department, billing department as well as the customer service department. 5. For assistance, zero to speak with one of our representative. 6. Please listen to our new to reach the person you d like to speak with. 7. Our are from 8 am to 4 pm. Reorder the sentences Message 1 to assist you this afternoon. please leave a detailed message and Today is May 10 th and press "0" for assistance. However, I will be pleased To make sure I can return your call, Hello, I will get back to you as soon as possible. If this is urgent, I will be in meetings all morning. this is Jane Jones. Welcome Your Avaya voice messaging system is a complete call answering and voice mail system. Call Answering Intuity AUDIX answers your calls when you are unavailable or too busy to answer your phone. The Voic service includes many features that allow you to more effectively handle your voice communications. VoiceMail Subscriber Guide Introduction: Thank you for choosing PriorityONE VoiceMail! The VoiceMail service includes many features that allow you to more effectively handle your voice communications. Interchange/Corporate Office Telephone User Interface (TUI) Pocket Guide Interchange/Corporate Office Telephone User Interface (TUI) Pocket Guide Copyright 2004 Comdial Corporation All rights reserved.